In the eighth inning of the Cardinals’ NL Central-clinching beatdown of the Pirates, there was a very strange play that I have never seen before. With a runner on first, Pirate Chris Stewart hit a blast to left-center. 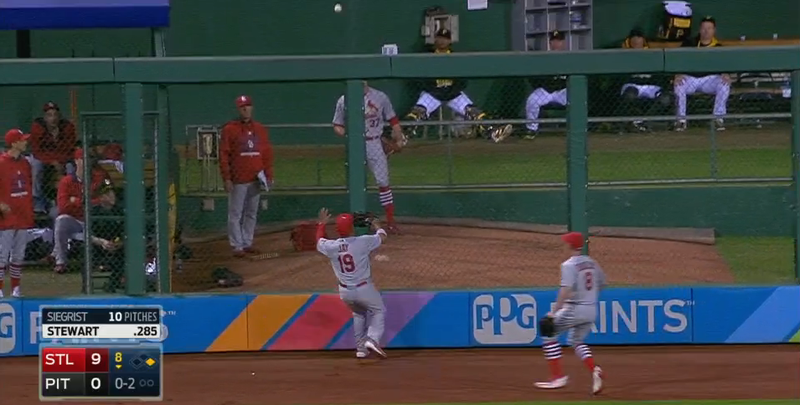 Cardinals left fielder Jon Jay motioned that he had it, and proceeded to miss the catch. The ball bounced off the warning track, the fence, and dropped into Jay’s glove. But instead of immediately throwing the ball back, Jay motioned like it had bounced over the fence for a ground rule double. And Jay’s trickery worked! The Pirates runner who could easily have scored was held up at third. Faking a ground rule double in that situation is an extremely strange decision. There is no signage, overhanging seats, or other out-of-play obstacles that the ball could have bounced off: it seems pretty obvious that the only thing it hit was the fence, and that it shouldn’t have tricked anybody. And the Cardinals were up 9-0 at the time; why is Jay resorting to trickery instead of just getting the ball back to the infield as fast as possible? Is it possible that Jon Jay wasn’t out to trick anybody, but actually thought it was a ground rule double? After he misses the catch, Jay sort of slams into the fence and isn’t looking up immediately. Maybe he thought the ball really did hit off of something, or that somehow a lightning fast teammate in the bullpen threw the ball back over the fence? After the champagne celebration ends, hopefully a reporter asks Jay about the play.